Strawberry Rhubarb Pies are Here! It’s rhubarb season again and that means it’s time for some of the best pies of the year! strawberries and 1/2 rhubarb it has the perfect sweet/tart contrast and a pie crust top. Available in 7″ & 10″. Strawberry Rhubarb Crumb– A strawberry Rhubarb pie with a crumb top. Available in 5″ only. 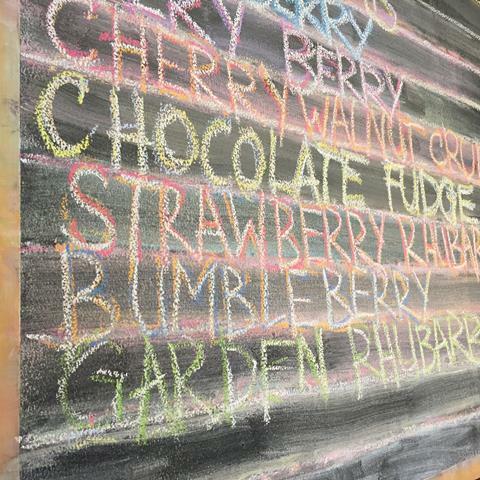 Bumbleberry- A true spring favorite. Bumbleberry pie is made with blueberries, raspberries, cubed apples & rhubarb. This is the perfect choice if you just can’t decide between all the spring options. Also, it’s a great introduction to rhubarb for those who have never tried it. Available in 7″ & 10″. Garden Rhubarb– Garden rhubarb is our straight rhubarb pie. For rhubarb lovers there is nothing better than a slice of rhubarb pie with a scoop of vanilla ice cream. If you’re not sure if you like rhubarb we recommend trying one of the other pies before treating yourself to one of these:) Available in 7″ & 10″.